So now that you've familiarized yourself with The Sailo Calculator, how do you figure out if you should charter or buy the boat? Whether you're considering to buy or rent a powerboat, sailboat, yacht, catamaran, or anything else, you should consider all the costs (including hidden costs!) that go with ownership: financing, insurance, taxes, docking, maintenance and fuel, among others. So go ahead and play around with the assumptions on The Sailo Calculator to get a reading of what your final cost will be. In the screenshot below you can see an example of that value. 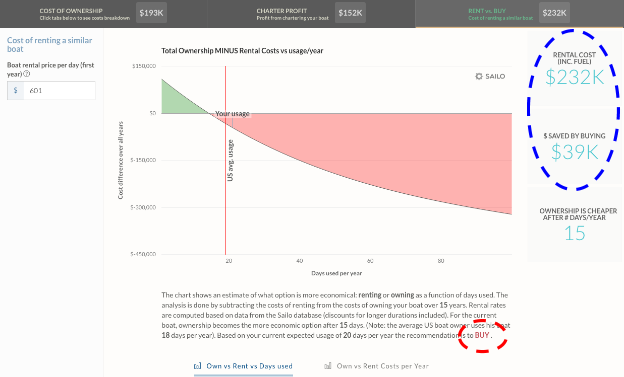 In this case, the $152k you'll make chartering your boat won't be enough to offset the $391k of gross ownership costs and the final cost to you will be $193k. However, if you rented out a boat for the same number of days (20 days / year in this case), would it cost you more or less than $193k? We do the math for you and this is where the Rent vs. Buy tab comes in handy! 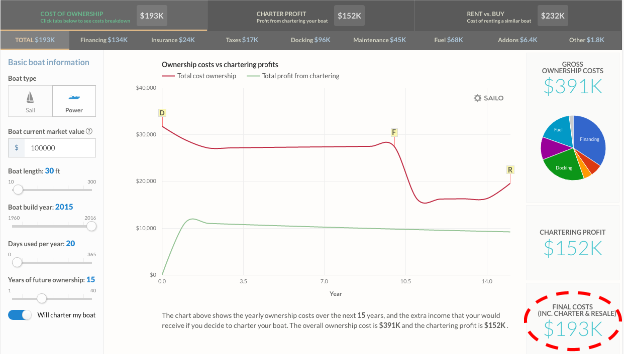 Unless you want to make your own assumptions about what you'd pay to rent a similar boat, we've made our estimate based on our rental database and calculated what it would cost you to charter the boat out. The screenshot below shows it would cost you $232k.That's $39k more than the $193k we estimated it would cost you to buy it. Long story short, we give you our recommendation, "Buy" in this case, at the end of the report. 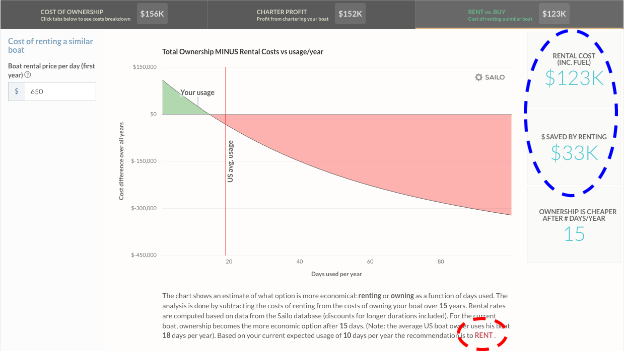 You can now see that the recommendation has changed to "Rent" and the math has been re-calculated to show how much you'd save by renting, $33k in this example. In conclusion, you can play around as much as you like with the assumptions on each tab and when you get back to the Rent vs. Buy tab, you'll find a freshly calculated recommendation. Enjoy!